RubyFrost: A later-ripening variety with "a beautiful skin and a nice sugar-acid balance" with a "crisp juiciness." Comparable to an Empire or Granny Smith. The apples are available this summer, but there aren't that many being grown currently. Cornell says they should be showing up in stores in 2015. Update: A Cornell spokesman says at least one orchard in this area is slated to have them at their farm stand this fall: Bowman Orchards in Rexford. The two varieties have been a decade in the making, and how they've gone to market is a first for the Cornell apple-breeding program and the New York apple industry. Historically, public universities developed new apple breeds and released them to the industry freely. But in 1980, the Bayh-Dole Act gave universities the right to retain the intellectual property rights for their research, with limited plant-based royalties. In May 2010, Cornell forged a partnership for a "managed release" with [New York Apple Growers], a new industry group, to establish an exclusive licensing agreement in North America for the two apple varieties. Growers pay royalties on trees purchased, acreage planted and fruit produced, and the income is used to market the new varieties and support Cornell's apple-breeding program. 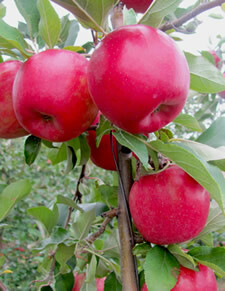 Cornell has released 66 apple varieties since the 1890s, according to the press release, including the Cortland, Macoun, Empire and Jonagold. Any idea if any of our local orchards are growing these? Peter Ten Eyck (Indian Ladder) has always been forward thinking in experimenting with new varieties. That SnapDragon apple is stunning, almost like a story book apple. Or something from the Garden of Eden. @chrisck: I checked with Cornell, and spokesman said Bowman Orchards is set to have them this fall at their farm stand. There might be a few others in the area -- I'm waiting to hear from the apple growers group. And I was also struck by the appearances of the apples -- I hope their flavor tracks with how they look. Of course a "food stylist" might have made those apples look particularly photogenic. T.U. article this morning says Indian Ladder is growing SnapDragons that will be available next year. I saw somewhere that Samascott has them as well. I picked up some Snapdragons from Bowman's today -- they're really, REALLY good.